Kimberley Diamond Cup will be the name of the new mega international skateboarding event to be staged in the city from 27-29 September 2013, Mr John Block, MEC for Finance, Economic Development and Tourism in the Northern Cape announced today. “This exciting new brand of international competitive skateboarding is a uniquely Northern Cape brand that will also have a presence in the Western Cape, KwaZulu-Natal and Gauteng as the province strives to enhance its reputation as an ideal destination for extreme sports and adventure events,” he said. Block added that the skate fans can expect 150 top pro and local skateboarders to participate in the Kimberley Diamond Cup street, vert and mini-mega formats this year. Mr Patrick Seboko, head of the Department of Economic Development and Tourism, revealed that United States-based company World Skateboarding Grand Prix won the tender for staging the Kimberley Diamond Cup and presenting an action-packed 12-month long support programme. This will include three “high octane” street and team Grand Slam skate competitions to be staged in Cape Town, Durban and Johannesburg each offering a total prize purse of R50 000-00, said Seboko. Seboko mentioned that World Skateboarding Grand Prix will join hands with South African project management company Pragmatics and international skate event experts to deliver the Kimberley Diamond Cup, Grand Slams and a year-long, fun-filled line-up of skate competitions and other events to take place at the skate plaza in Kimberley. World Skateboarding Grand Prix is already working with the Northern Cape government, the global skateboarding community and event sponsors to design events and programmes to take competitive and fun skateboarding to new levels in the Northern Cape and South Africa, cited Seboko. A revitalised Skateboarding for Hope campaign aimed at promoting skateboarding as a positive and easily accessible lifestyle alternative will also see events staged at the newly-built mini-skate parks in Kuruman, De Aar, Upington and Springbok and ten other towns in South Africa, said Block. He added that the Skateboarding for Hope campaign will now incorporate a skater mentor ship programme designed to enhance local talent, which is a further sign of the provincial government’s commitment to the youth. Block stated the Northern Cape Province and Kimberley proved their capability of successfully hosting world-class events. “We have signed up a renowned skateboarding management team and market leaders in competitive skateboarding, all who have been responsible for many of the innovations in world-class skateboarding contests over the last six years,” he said. The provincial government is confident that owning its own brand of competitive skateboarding will open a number of lucrative opportunities to further stimulate local economic development and the tourism industry in the province, confirmed Block. The Boss Andrew Reynolds catches one of his Classic Frontside Flips down the Big 4. Competitive street and team skateboarding in South Africa is about to gear up a big notch with the Kimberley Diamond Cup Grand Slam competitions being staged in Johannesburg, Cape Town and Durban in September. Each Kimberley Diamond Cup Grand Slam event will have a total prize purse of R50 000 and is set to attract South Africa’s best street and team skaters. Top street skaters will also win themselves a wild card entry to the amateur street skating format of the Kimberley Diamond Cup skateboarding world championship. Skateboarding is one of the most entertaining extreme sports in the world and the Northern Cape will use the Kimberley Diamond Cup Grand Slams to promote the province as attractive destination for mega events, “high octane” sports and adventure tourism, said Mr. Patrick Seboko, head of the province’s Department of Economic development and Tourism. Gavin Powell of Boogaloos, activation partner of the Kimberley Diamond Cup Grand Slam events, said each Grand Slam will start the day with skateboarding clinics presented by top local skaters and skateboard give-aways before moving on to the beginner’s competition, a “best trick jam” and the advanced street skating competition. Skateboarding fans will further be entertained to skate teams vying for the top spot and a pulsing musical concert to end of a day of hard skating, he said. Scheduled for Johannesburg (1 September), Cape Town (8 September) and Durban (14 September), these Kimberley Diamond Cup Grand Slam events will give local street skateboarders the final opportunity to make it to the amateur street skateboarding line-up in Kimberley on 27 September this year. Teams made up of four skaters will compete in a jam-format competition, where their solo scores also count towards their team’s overall score. The winning team will be determined by the group of individuals with the highest score at the end of the day and will then battle it out for the All Cities title against eight teams from across the country on 27 September. (Sacramento, Calif. – September 19, 2013) – World Skateboarding Grand Prix today announced the events schedule for the 2013 Kimberley Diamond Cup World Skateboarding Championships presented by Kumba Iron Ore. A full week of activities leading up to the contest includes skate clinics and demos, giving the pros the opportunity to meet and inspire the local kids and youth who have embraced skateboarding all across the Northern Cape provinces. Kimberley is located 300 miles southwest of Johannesburg in the Northern Cape Provinces. A small town of 97,000, the city is proud of its heritage as the location of the first diamond mines in South Africa and the origins of its nickname, The Diamond City.” Pro skaters from around the world, competing in the Kimberley Diamond Cup, will get to visit area attractions, including “The Big Hole,” and experience safaris daily, in the week leading up to the contest. 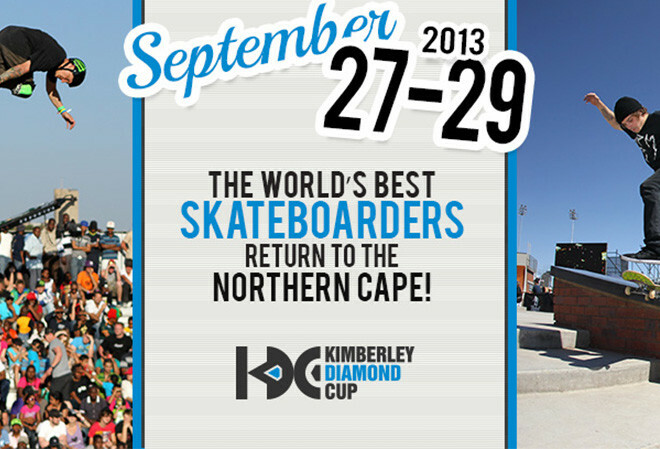 The Kimberley Diamond Cup world skateboarding championships takes place Sept. 27-29. Pros will battle it out for their share of a $500,000 prize purse, the largest single event prize purse in skateboarding. The winner of the Street Championships will receive a $100,000 cash prize. The winner of the Vert Championships will receive a $60,000 cash prize.